Our figures impressively show how popular the flexible car2go carsharing service is. Studies indicate that the popularity will increase even further over the next few years. The carsharing trend is continually picking up momentum. As a pioneer and global market leader, car2go is a big player in the flexible carsharing sector. 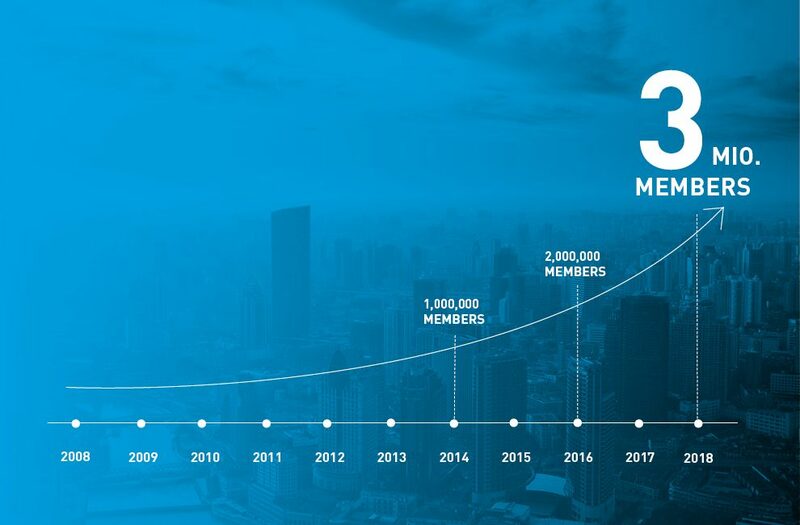 The number of people who share the approximately 14,000 car2go cars, and thus enjoy individual, flexible and sustainable mobility, is growing at an ever-increasing rate. The continually shorter intervals required for car2go to reach the next million member mark prove this: after the first car2go pilot project in Ulm in 2008, it took six years for the “first million”. The second million was achieved in September 2016, thus taking two and a half years. And, the three million customer mark was achieved in just sixteen months. The three million car2go customers are spread over 26 locations on three continents. The majority of customers use car2go in Europe (1.75 million), closely followed by North America (one million). In China, where car2go has one location in Chongqing, 235,000 customers currently use car2go. 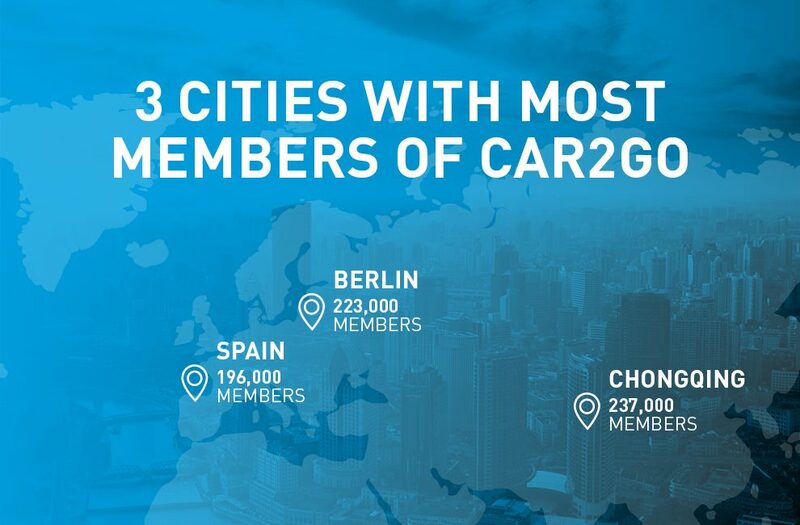 With 237,000 members, Chongqing is the city with the most car2go customers worldwide, followed by Berlin (223,000 customers) and Madrid (196,000). “Three million car2go customers and the dynamic growth rate impressively show how popular the flexible carsharing offered by car2go is in cities. 30 percent customer growth in the year 2017 speaks for itself. And, there is still huge potential for further growth – studies estimate that the number of carsharing customers will increase fivefold over the next few years,” says Olivier Reppert. It will therefore be exciting to see how the market develops over the next few years and where, in the future, it will be possible to drive with a car2go from A to B and park with no stress. 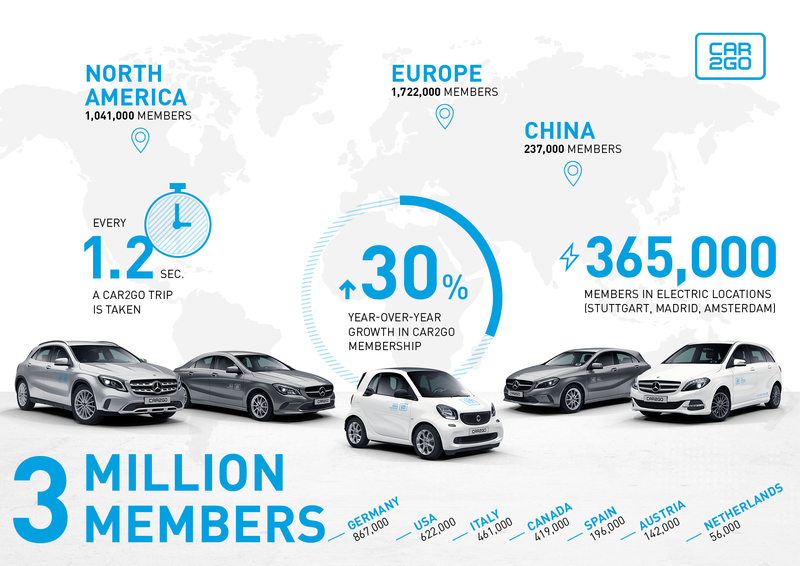 Are you surprised by the fact that there are already so many car2go members worldwide?